SEO / BirdLife has warned that the pollution sea by plastic poses a serious threat to the Canary populations of seabirds , especially shearwater, because 83% of chickens analyzed in recent studies by canaries scientists had plastic in their interior, with an average of eight fragments per individual, which would have been ingested next to the food provided by the adults. Another of the seabirds potentially affected by the ‘marine trash’ and that are threatened are the parrot pichoneta and the small shearwaters , also belonging to the group of the procelariformes. Unlike seagulls and other seabirds, the prolalariformes do not form egagropilas -‘balls’ formed by the non-digestible parts of the ingested food, which regurgitate before entering the stomach-, so they accumulate more easily small fragments of plastic that They capture on the surface by confusing it with their prey (planktonic organisms, fish and cephalopods) or with it, or that they are inside their food. Generally, these are very small fragments, but larger plastics can also be found, and their accumulation can cause ulcers, infections or even drowning . The presence of plastics in the stomach can also create a feeling of satiety, which would lead to death by starvation, point out from SEO Bird Life. In addition, larger plastics can cause snags and entanglements, which can cause amputations, drowning or starvation. 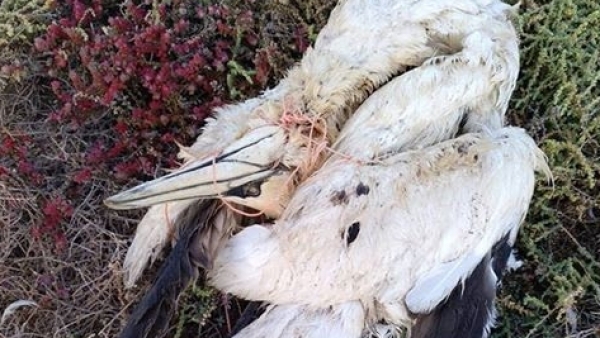 In this case, in addition to the shearwaters, other seabirds such as gannets, gulls and terns may also be affected. Many of these plastics are abandoned on the Canary coast, dragged by the wind from uncontrolled landfills or reach the sea pushed from the ravines in rainy seasons. But they also come from places thousands of kilometers away , according to researchers from the University of Las Palmas de Gran Canaria (ULPGC). Thus, they are garbage arriving from Europe , Africa and even from the east coast of the United States , dragged by the currents of the Gulf and the Canary Islands and it is estimated that each tide throws on the Canary beaches up to 120 grams of small pieces of plastic per meter square, which means several tons per year in each of the islands. Strategies against plastics With this same university, SEO / BirdLife has initiated a collaboration with which it aims to improve knowledge about the impact of plastic on the fabric of the Canarian seabirds, for which volunteers will be involved in the island of Tenerife. The organization applauds the initiative of the Government of the Canary Islands for launching a strategy to combat plastic pollution and urges the Executive to “quickly implement the Management Plan and Prevention Program Canary Waste (PIRCAN) will present this month and it should have been renewed in 2006. “We also remember that a good part of the councils does not yet have their Special Territorial Waste Plan, as required by law,” says Acosta.